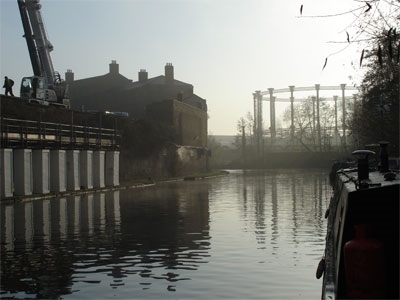 Distant gas cylinders rise majestic in the east, and gongoozling daffodils are nodding by the mooring bollards as we rise up the lock. I’d like to say that we left London in a glorious blaze of independent freedom. But our final exit from London to The Countryside is not even under our own steam. We are tied to The Coal Boat; buttied up, side by side. Our engine failure is serious. The bearings have gone. I don’t know where they have gone but they’re gone for good. This could mean that we need a new engine. If the engine is not running the only way of getting electric is the solar panel: so there’s not enough electric to run the fridge. Should we stay on the new boat instead? The heating is broken on the new boat. It is now a year since we cruised west, hopeful of exploring the Kennett and Avon. Now, we make the same journey limping alongside The Coal Boat, heading to Denham to get our engine fixed. I made coffee and handed two mugs and two biscuits to Coal Lad who was steering the boat. Their business is called something like ‘Coalman and Son’, but Coal Lad is no relation. In fact Coal Dad is one of the sons of The Coal Man, who is the wise old gentleman of Denham, and will be rebuilding our engine. Because we are being towed there is no one steering our boat. It is the first time ever that all four of our family have been inside while cruising. We went through Camden Lock at the girls’ bedtime. Big Sister came out on to the back deck barefoot and in her pyjamas. “Night night Daddy!” she calls up to the lock-side. The Doctor was beside the balance beam holding a windlass, and we’re looking up at him from the bottom of the grimy lock. “You must have been very good,” he grins affectionately. I take her indoors and tuck both girls in. They sleep to the sound of The Coal Boat engine chugging along outside our kitchen window. It’s dusk. There are twinkling fairy lights in the willow tree that towers over Camden Market. The three waterbus passenger boats are sleeping on their mooring. We turn the corner into Regents Park and glide through the aviary of London Zoo. I hear the sound of peacocks calling. We’re like a fly on the wall witnessing the working life of The Coal Boat. We accompany them on their deliveries to liveaboard boaters and arrive in Little Venice in the dark. When the engine is quietly sleeping we can hear the geese on the island in Robert Browning’s pool. Hi Peggy - great to discover your blog and HUGE thanks for reminding me about the carnvial! Thanks Mrs Muddling! I've not had time to read the other entries yet. It's been a hectic day with the little one... thanks so much for putting me in it.